Renowned for his technical abilities and restorative powers, Jeffrey Koepper has become distinguished for his work in maintaining, reviving and often performing miracles on vintage electronic music equipment. Elsewhere, he is (along with Kelvin Russell) known as half of Pure Gamma, the duo that brought together the old-school ambience of the '70s with the techno/chillout culture of the '90s. In 2003, Koepper has finally popped his head up from behind his vast museum's worth of gear and presented the world with a long-awaited studio album. 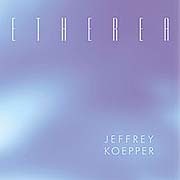 On Etherea (72'12"), Koepper demonstrates a mastery beyond the technical side of his craft. The 10 tracks alternate between the analogue bubbles and digital ice of the American synth 'n sequencer revival of the '80s - and bright, smooth and spacious tonal landscapes where wide swaths of stereo phasing, thin lines of sawtooth buzzes and soft clouds of revererant strings paint the air with an enduring ambience. Building on familiar Spacemusic forms, figures and themes, the genre calls for Koepper to add that immeasurable factor: his own individual human component - which ignites the sonic imagery of his music. With Etherea, "Analogue Jeff" the gearhead is transformed into Jeffrey Koepper the artist. By applying his vast technical knowledge of music making equipment towards programming beautifully evocative ethereal sounds and strong rhythmic designs, Koepper has put together an album of impressive depth and rare intelligence.